Starsky fosters student learning through innovative, high-impact practices such as student research opportunities, collaborative student assignments, service learning and capstone projects. Andrew Starsky. Photo courtesy of Marquette University. MILWAUKEE – Dr. Andrew Starsky, clinical associate professor of physical therapy in the College of Health Sciences at Marquette University, recently received the university’s highest teaching honor, the Robert and Mary Gettel Faculty Award for Teaching Excellence. 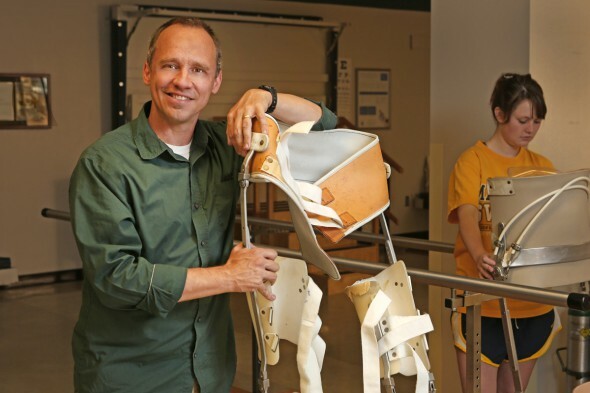 Starsky has a unique approach to educating students across three different degree programs in the Department of Physical Therapy. From pulling out a guitar and singing a song about “gait analysis,” to learning all of his students’ names by the first week of class, Starsky’s students appreciate his engagement and dedication to their education. “He provides students with a truly memorable educational experience, using a dynamic, engaging, innovative style of teaching to make learning interesting and especially long-lasting,” said a colleague. “I am a strong believer in the value of a college education. I calculate how much the students are paying per hour of class, and give them a money back guarantee. I promise to make each hour worth it, or I will refund their tuition for that hour. Fifteen year of teaching and no refunds yet,” said Starsky. Teaching Excellence Awards are the highest honor bestowed upon Marquette University faculty members. Recipients are nominated by their colleagues and students for demonstrating excellence as teacher-scholars.